Outside of trying to deal with any stubborn breakouts, the number one result I am constantly in search of is radiance. Obviously a serious peel or intense exfoliating treatment is a guaranteed shine, but I enjoy finding other products that I can add into my skincare routine here and there that help me keep that glow going. There are 3 products I've recently been testing and so far my initial thoughts have been quite favorable. I still have a few more weeks to go until I can see final results, but these are my first impressions. 1. 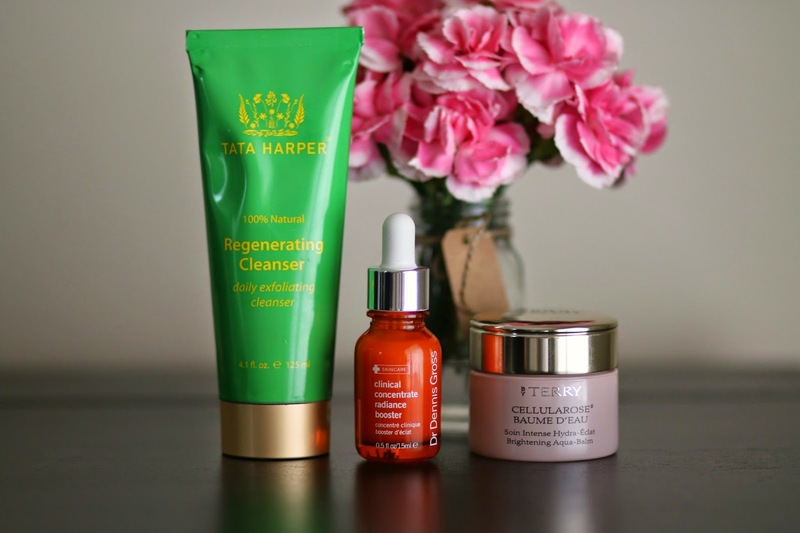 Tata Harper Regnerating Cleanser - Already a fan of the Tata Harper resurfacing mask (review here), I had high hopes for this cleanser. I am a sucker for reviews, and I have seen this cleanser getting great marks out there on the ol' net. Now I can see why. The texture is slightly grainy but nothing that feels irritating, in fact it feels delightful. I typically switch up my cleansers often, but I hunkered down and used this every day for almost a week straight and I kid you not, my skin was practically that of a newborn baby. I've had it in rotation for a couple weeks now and while I have allowed some other cleansers to jump in, I absolutely still swoon every time I use this. I know this is a bit of a splurge, but those enzymes in the formula really earn their stripes. 2. Dr. Dennis Gross Clinical Concentrate Radiance Booster - This is part of the booster trio that was released recently, but this is the first one I tried. Since it can be added to your current serum, moisturizer or foundation for a 'boost', I thought I would give it a go in my morning skincare routine. I began adding it to my morning serum (currently I am using this) and was not too sure I noticed much of a difference the first few days. Fast forward about 2 weeks and I realized that there was a marked change in the texture of my skin. And though I am not a scientist, I feel as if it is making my current serum work even better. I have been using the Clarins Double Serum for about 4-5 months now and wasn't sure I was seeing such great results anymore, and then I added the booster and I feel like the initial results of the serum are back and even stronger. Stay tuned for my thoughts on the remaining two boosters. 3. By Terry Cellularose Baume d'Eau - The name didn't do much to lure me in until I looked right under the name and saw "Brightening Aqua-Balm". Yup, that sealed the deal. I've said before that while I do care about anti-aging, I find that hydration is one of the best ways to keep skin looking fresh and youthful. 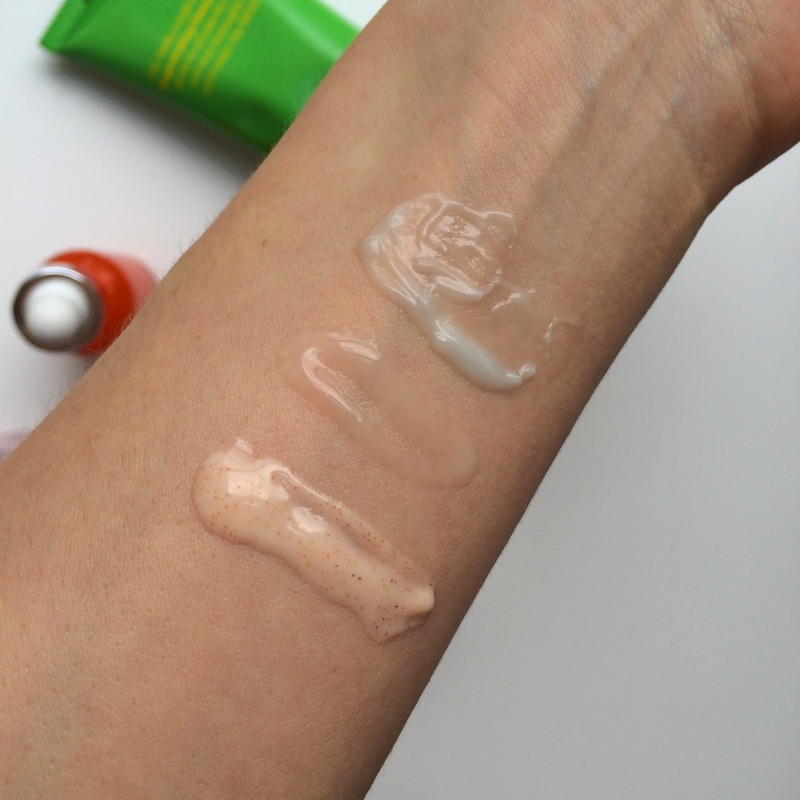 This balm is like the most intense drink of water for your skin. The gel texture feels weightless to the touch but once it goes on, there is no doubt it delivers serious moisture. Though it seems like the ideal product for summer, I can tell you that this is the exact kind of moisturizer I need for the colder months. Quick, intense hydration that absorbs immediately without leaving my skin feeling heavy. I am already a quarter of the way through it in just a few weeks, and since I rarely finish a moisturizer this is quite a feat. And a testament to how much my skin loves it.